Review: Black Thunder Studio Mocotaugan. 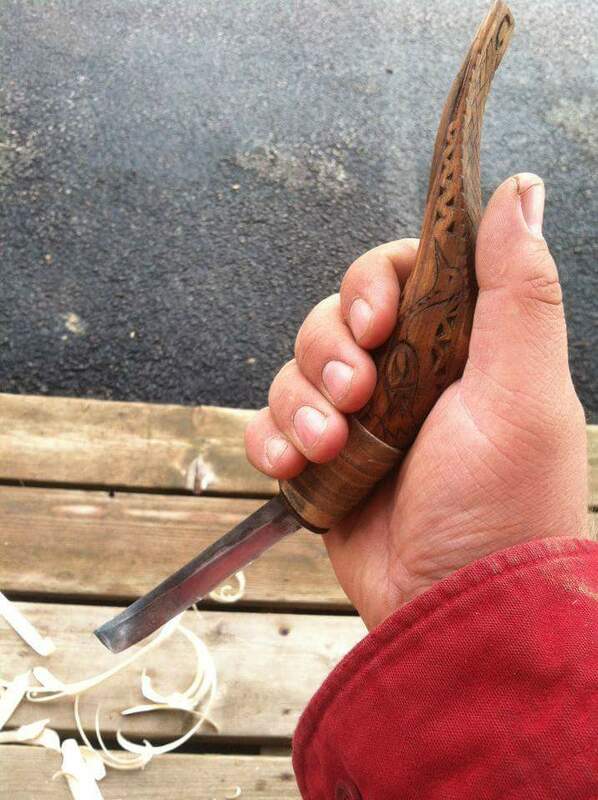 Often mistitled a “Crooked Knife” by English speakers, the Mocotaugan is a very unique tool in today’s Woodcraft/Bushcraft realm. It is unique on several fronts; it is a strictly Indigenous-designed tool, it is multi-functional, it is unmatched in utility. The name “Crooked Knife” I’d like to help wipe off the list of names this tool goes by, as it confuses people with Crook Knives (the spoon carving knives shaped like a Shepherd’s Crook). The very first time this knife was described in detail was by the Hudson Bay Company, who lacking an English name for it, called it by the northern Cree name of Mocotaugan, which means “To bring the spirit out of the wood”, and describes the act of shaping wood into useful implements. To me, that’s a much more appropriate name. 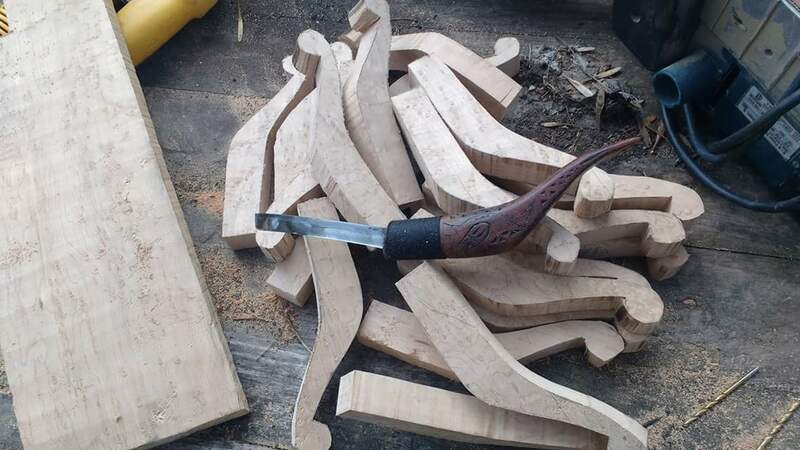 The shape of the blade allows you to use it like a one-handed drawknife (useful when the only vice or clamp available is your other hand), a spokeshave, a gouge, scorp, carving knife, and many other tools. Its’ what one Elder of mine calls an “Ojibway Swiss Army Knife”. I have worked with Mocotaugans for over a decade and a half, first starting off as many do; with rough sketches, and building my own. Crude, though they got the job done. Over time I got the chance to handle Pinock Smith’s Mocotaugans, and even a couple of William Commanda’s. These gave me the chance to understand the intricate angles needed to make the tool work. Where many modern knifemakers fail, the Indigenous artisan will wisely look at ergonomics. the blade is offset within the handle, tilting upwards and backwards from the cutting edge. This allows for a balanced draw cut to be performed. The angles that the blade has, is crucial for the performance of the tool. Though many people have gotten close to the mark, the only ones I have found that truly fit the tasks at hand, are those made by Indigenous craftsmen. This is most likely due to generational understanding of the duties to be performed by their Mocotaugans. Cree, Ojibwa, Algonquin, Dakota and Pottawottomi craftsmen who build bark canoes, snowshoes, drums, lacrosse sticks, sugar troughs and countless other implements rely on the proper angles of their Mocotaugans to get the tasks done without fatigue to their wrists and hands. I have handled at least a dozen different knifemaker’s Mocotaugans, including the making of over fifty of my own (often gifted away, or traded to friends, relatives or elders of mine). So I think I have become experienced enough in what is “right” and “wrong” in different maker’s tools. The one person who has really spent the time with Elders, and on his own practicing with these tools until his own were well honed implements, is Nick Dillingham of Black Thunder Studio. About three years ago I first ran into Nick’s work online. Beautifully made noggins, baskets, canoe paddles and other items I could drool over. At the time I was really the only guy that I knew of in the Canadian scene promoting the use of Mocotaugans. One day Nick posted up online one that he had made, and I sat there stunned at its’ beauty. We began chatting around that time, and six months later I sent him the cash for my very own one. He made the blade out of an old file, which he ground to a mirror polish, and tempered exquisitely. The handle was a piece of three-toned cherry that he stained with boiled hemlock tree bark, and burnished with a deer antler until smooth and comfortable. He chip-carved my Clan’s effigy (the Blue Heron) into the handle, and added a twilled basket-motif to the thumb-ramp. His work was museum quality for sure. Even though I praised the Mocotaugan’s beauty online, I would not review it immediately, as I believe a proper review takes more than a couple of months. Well after two and a half years of use, and the launch of Nick’s new website (www.BlackThunderStudio.com), I felt it was time to review it. This is not a very good review though. It is more of a love ballad. This Mocotaugan takes a hair popping edge very quickly, and remains sharp even when shaving dense, seasoned hardwoods (I have shaped more than a few birdseye maple axehandles, oak mauls, and a couple of ironwood bowls with it). The edge geometry is very multifunctional; good at shaving softwoods rapidly, while being able to resist rolling the edge from denser woods. The handle and blade are well balanced together on their respective angles, to cause little to no hand fatigue when carving for many hours. I’ve spent entire weekends shaving canoe paddles from Butternut and White Ash, without any noticeable strain to my wrist or hand. The blade has never jarred loose from use, which is something a lot of other Mocotaugans (admittedly including a couple of mine) are prone to do. Nick really does understand the utilitarian needs of this tool, and you can tell that when you handle one of his. There are so very few people that are making these tools now adays, and though their popularity is ever growing in the Bushcraft community, few of the knifemakers are catching onto the subtle nuances of the Mocotaugan’s biology. 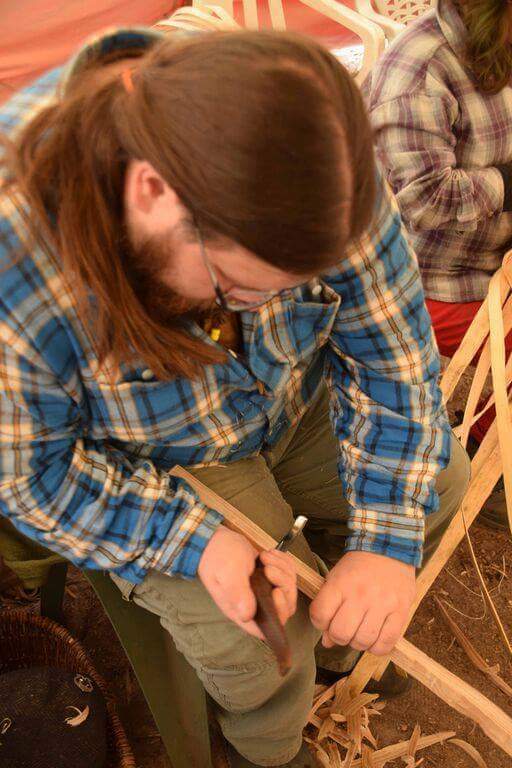 Nick’s study of this tool is in my opinion Second-to-None, and though I am not comfortable with throwing around the words “Master” or “Expert”, I’ll definitely say without any hesitation that Nick is this generation’s Authority when it comes down to the Mocotaugan. I have nothing but praise for this tool, and it will be with me in the woods until the day I pass on. Well written review of Nick’s fantastic Mocotaugans. I could not agree more with Caleb. I have two of Nick’s Mocotaugans in my canoe builders tool set (as well as two awls Nick made up for me)….best Mocotaugans I have used….definitely made by a Master Mocotaugan craftsman (which is exactly what Nick is….a Master of the Mocotaugan). This coming year (2017) I will be involved in 6 or 7 bark canoe builds….and will put these great Mocotaugans to full use. We will be documenting several of the builds….and I will gladly share photos of Nick’s fine Mocotaugans at work. As Caleb pointed out about his Mocotaugan made by Nick: “….takes a hair popping edge very quickly, and remains sharp….edge geometry is very multifunctional….handle and blade are well balanced together on their respective angles, to cause little to no hand fatigue when carving for many hours…..without any noticeable strain to my wrist or hand.” Couldn’t have said it any better…. To quote Caleb again: “Nick really does understand the utilitarian needs of this tool, and you can tell that when you handle one of his”…..one can get the tasks done without fatigue to one’s wrists and hands. Simply put I have not found a better made Mocotaugan….and doubt I ever will. Forgot to add that in Anishinaabemowin (Ojibway) it’s called “Waabikoman” which means “something that shaves wood and brings it to spirit”. I am enjoying your articles and I have become very intrigued by the Mocotaugan as a versatile tool. I am sure you are asked this all the time, but how might a person purchase one of your Mocotaugans? I am curious about using a Mocotaugan to carve axe handles and large, shallow bowls. Thank you!